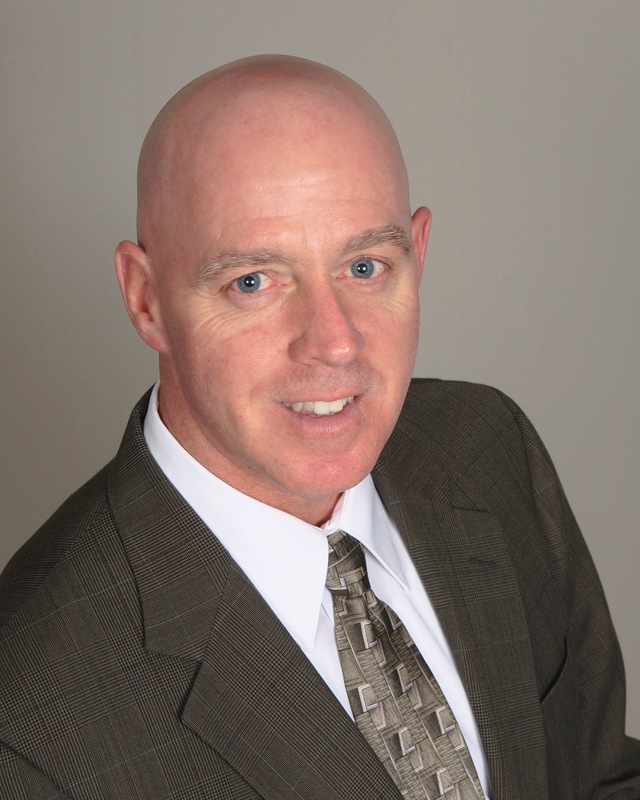 Jeff Potter will be providing leadership for all administrative functions at the corporate office in Weston. This includes overseeing finance, accounting, administration, risk, compliance, and human resources. Prior to joining FSA Logistix Jeff served as Senior Director of Store Operations at Office Depot leading a cross functional team to maximize “The Store of the Future,” Office Depot’s new store concept. 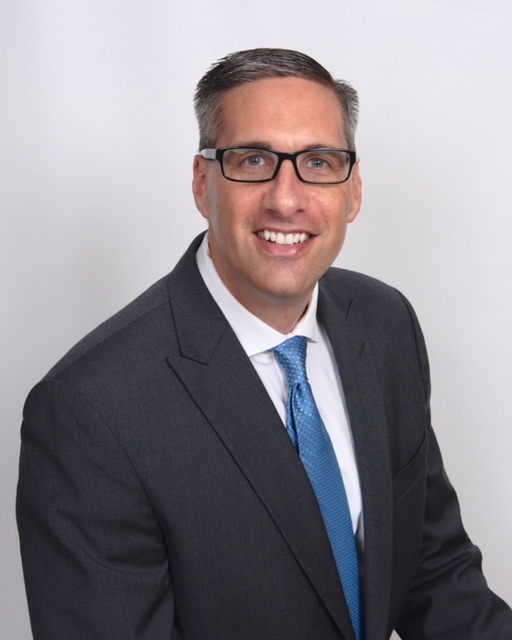 He served in other key roles during his tenure at Office Depot including Senior Director Retail of Sales and Services Strategy, and as one of the architects of new operational policies and procedures required during the Office Depot and OfficeMax merger. Prior to Office Depot, Jeff led OfficeMax’s “#1” strategic retail initiative. Jeff holds a B.S. in marketing from Stonehill College in Easton, MA. 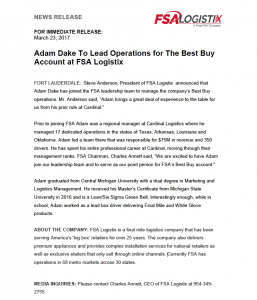 Dean joined FSA Logistix in March 2014 and in that same year became General Manager of the company’s Innovel business. In 2015 Dean was promoted to VP Operations. His new assignment as Senior Vice President of Operations expands his leadership responsibilities for the company over the company’s Innovel, General Electric, Best Buy and The Home Depot operations. 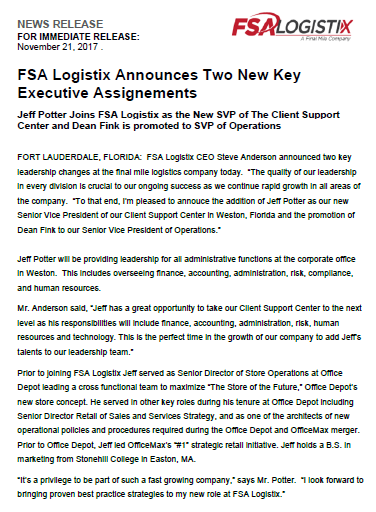 Dean will provide leadership oversight to more than 40 FSA Logistix locations across the country. Mr. Fink said, “Running geographically dispersed operations in several states can be challenging. But, the quality of our local operations teams makes my life easier and allows me to focus on strategy and taking care of our Clients.” Prior to joining FSA Logistix Dean spent 30 years in the LTL transportation industry working for both Roadway Express and YRC in local and regional roles managing businesses ranging from 10 to 110 truck operations. Dean holds a BS in Business Management from Clarion University. ABOUT THE COMPANY: FSA Logistix is a final mile logistics company that has been serving America’s ‘big box’ retailers for over 25 years. The company also delivers premium appliances and provides complex installation services for national retailers as well as exclusive etailers that only sell through online channels. Currently FSA has operations in 68 metro markets across 30 states. 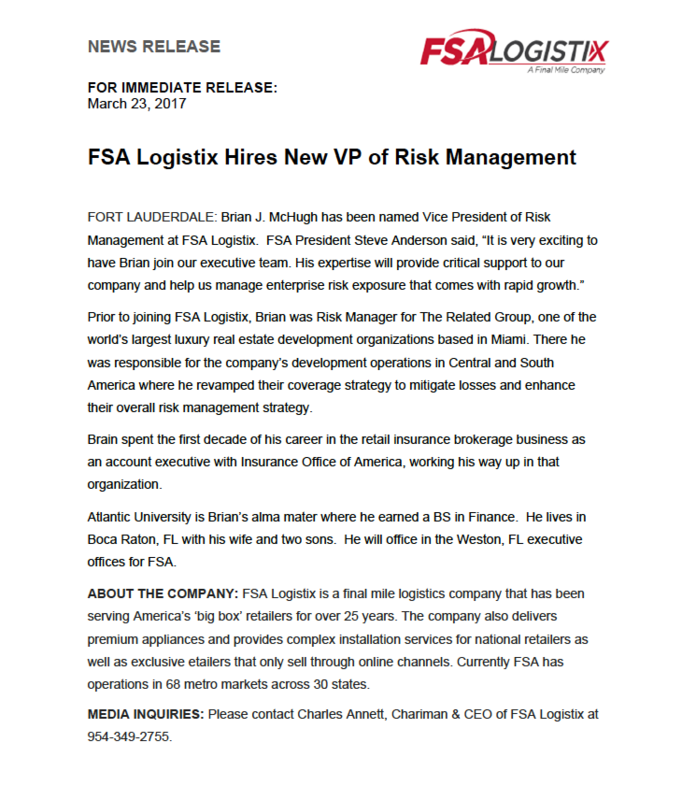 FORT LAUDERDALE: FSA Logistix announced today that effective January 1, 2018 Charles Annett will become Executive Chairman and Steve Anderson will take over as President & CEO of the company. This scheduled transition is part of a 5-year strategic plan that FSA Logistix leadership put in motion back in January 2014 when Mr. Anderson was hired as Chief Operating Officer. During this time FSA Logistix has grown at a compounded annual rate of +35% per year. In addition to building a world-class management team, the company has grown through strategic acquisitions, notably the addition of Guiney Delivery Services in 2015. This acquisition added significant capacity for FSA Logistix in the Chicago and Denver markets. FSA Logistix now operates 68 dedicated locations across the US in 28 states with a home office in Ft Lauderdale, FL and a Field office in Dallas TX. Even though Mr. Annett retains majority ownership of FSA Logistix, he has been gradually dialing back his involvement in the day-to-day business operations. This move to Executive Chairman will enable him to devote more time to strategic matters facing the company as it moves to its next tier of growth. Since FSA Logistix will continue to be a closely held corporation, the Board of Directors have approved this new officer position, and rather than have Board Committees, a new Executive team will be made up of the Executive Chairman, President & CEO, and Executive VP. They will meet weekly and direct long term growth strategy, assist in technology enhancements, review operations metrics and compliance, recommend improvements, and allocate financing for all approved projects. ABOUT THE COMPANY: FSA Logistix is a final mile logistics company that has been serving America’s ‘big box’ retailers for over 25 years. The company also delivers premium appliances and provides complex installation services for specialty national retailers. MEDIA INQUIRIES: Please contact Charles Annett, Executive Chairman of FSA Logistix at 954-349-2755. Adam graduated from Central Michigan University with a dual degree in Marketing and Logistics Management. He received his Master’s Certificate from Michigan State University in 2016 and is a Lean/Six Sigma Green Belt. Interestingly enough, while in school, Adam worked as a lead box driver delivering Final Mile and White Glove products. MEDIA INQUIRIES: Please contact Charles Annett, CEO of FSA Logistix at 954-349-2755. Prior to joining FSA Logistix, Brian was Risk Manager for The Related Group, one of the world’s largest luxury real estate development organizations based in Miami. There he was responsible for the company’s development operations in Central and South America where he revamped their coverage strategy to mitigate losses and enhance their overall risk management strategy. Brain spent the first decade of his career in the retail insurance brokerage business as an account executive with Insurance Office of America, working his way up in that organization. Atlantic University is Brian’s alma mater where he earned a BS in Finance. He lives in Boca Raton, FL with his wife and two sons. He will office in the Weston, FL executive offices for FSA. MEDIA INQUIRIES: Please contact Charles Annett, Chariman & CEO of FSA Logistix at 954-349-2755. 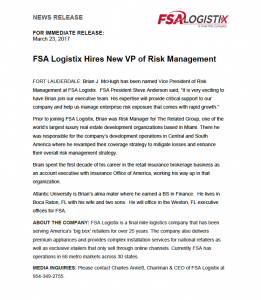 FORT LAUDERDALE: Michael Beaver has joined the FSA Logistix as VP of Operations and Business Development. 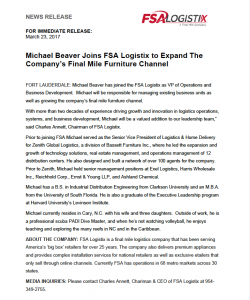 Michael will be responsible for managing existing business units as well as growing the company’s final mile furniture channel. 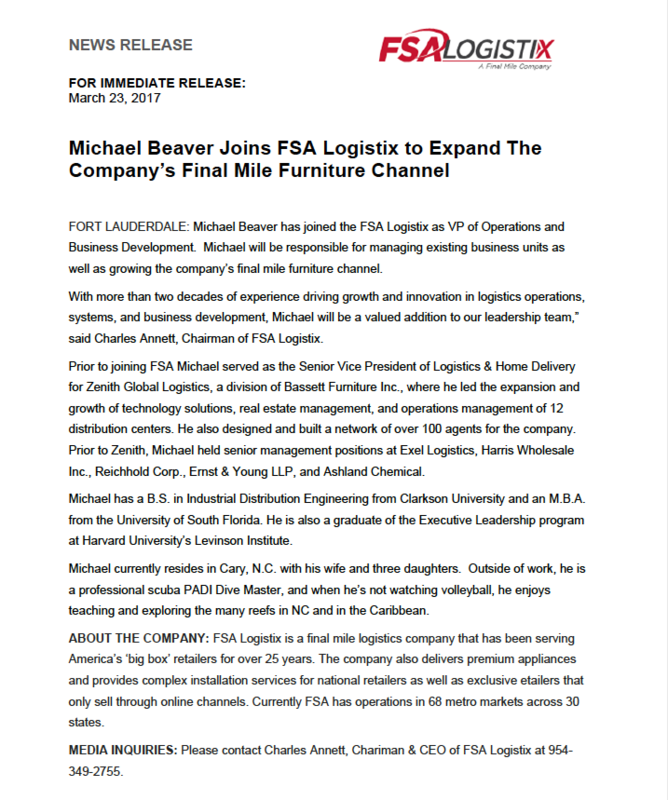 With more than two decades of experience driving growth and innovation in logistics operations, systems, and business development, Michael will be a valued addition to our leadership team,” said Charles Annett, Chairman of FSA Logistix. 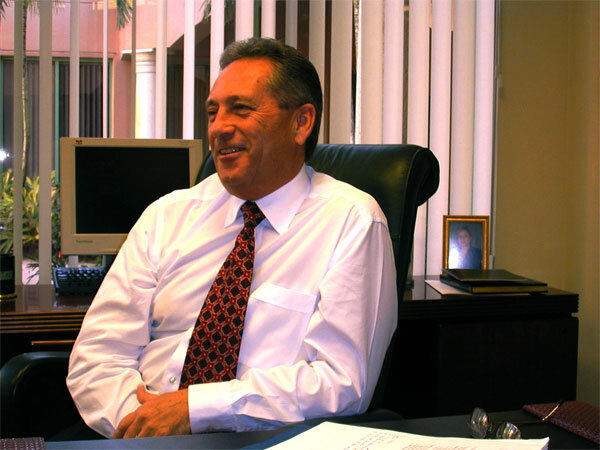 Prior to joining FSA Michael served as the Senior Vice President of Logistics & Home Delivery for Zenith Global Logistics, a division of Bassett Furniture Inc., where he led the expansion and growth of technology solutions, real estate management, and operations management of 12 distribution centers. He also designed and built a network of over 100 agents for the company. Prior to Zenith, Michael held senior management positions at Exel Logistics, Harris Wholesale Inc., Reichhold Corp., Ernst & Young LLP, and Ashland Chemical. Michael has a B.S. in Industrial Distribution Engineering from Clarkson University and an M.B.A. from the University of South Florida. He is also a graduate of the Executive Leadership program at Harvard University’s Levinson Institute. Michael currently resides in Cary, N.C. with his wife and three daughters. Outside of work, he is a professional scuba PADI Dive Master, and when he’s not watching volleyball, he enjoys teaching and exploring the many reefs in NC and in the Caribbean. 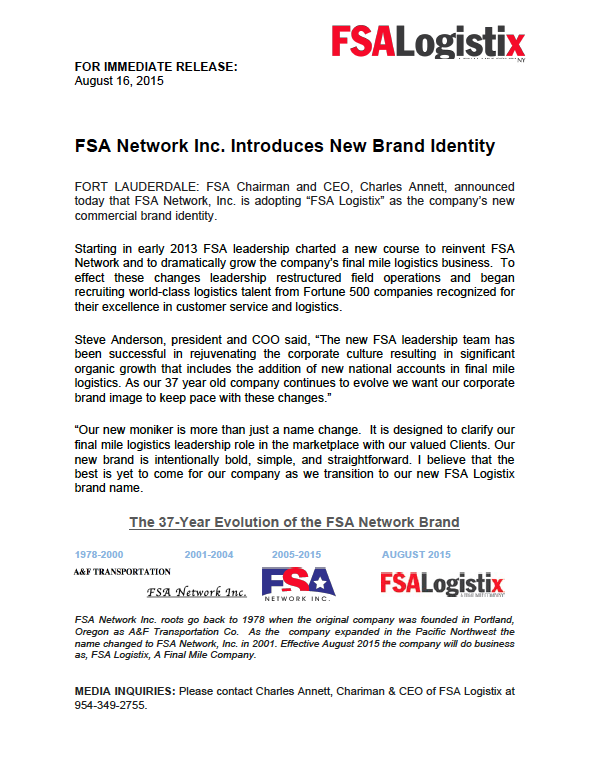 FORT LAUDERDALE: FSA Chairman and CEO, Charles Annett, announced today that FSA Network, Inc. is adopting “FSA Logistix” as the company’s new commercial brand identity. Starting in early 2013 FSA leadership charted a new course to reinvent FSA Network and to dramatically grow the company’s final mile logistics business. To effect these changes leadership restructured field operations and began recruiting world-class logistics talent from Fortune 500 companies recognized for their excellence in customer service and logistics. FSA Network Inc. roots go back to 1978 when the original company was founded in Portland, Oregon as A&F Transportation Co. As the company expanded in the Pacific Northwest the name changed to FSA Network, Inc. in 2001. Effective August 2015 the company will do business as, FSA Logistix, A Final Mile Company. 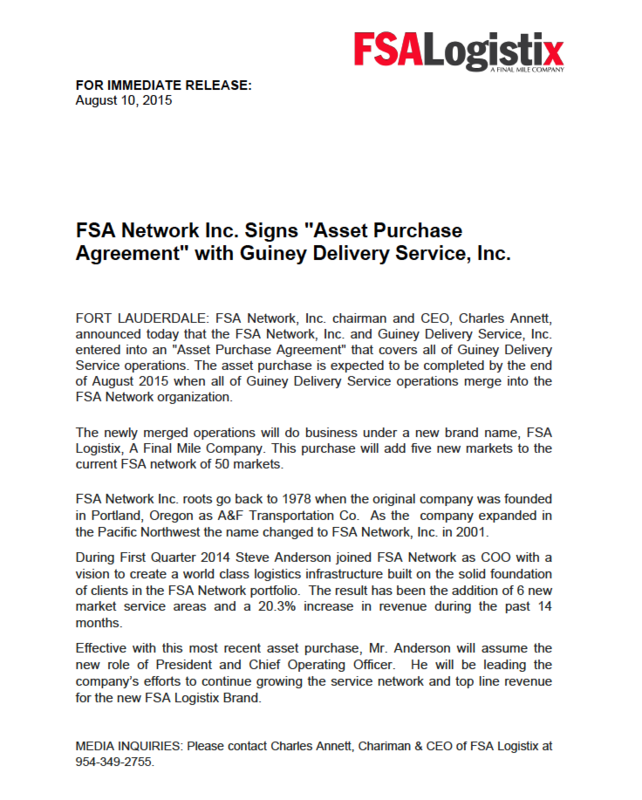 FSA Network Inc. Signs “Asset Purchase Agreement” with Guiney Delivery Service, Inc.
FORT LAUDERDALE: FSA Network, Inc. chairman and CEO, Charles Annett, announced today that the FSA Network, Inc. and Guiney Delivery Service, Inc. entered into an “Asset Purchase Agreement” that covers all of Guiney Delivery Service operations. The asset purchase is expected to be completed by the end of August 2015 when all of Guiney Delivery Service operations merge into the FSA Network organization. The newly merged operations will do business under a new brand name, FSA Logistix, A Final Mile Company. This purchase will add five new markets to the current FSA network of 50 markets. FSA Network Inc. roots go back to 1978 when the original company was founded in Portland, Oregon as A&F Transportation Co. As the company expanded in the Pacific Northwest the name changed to FSA Network, Inc. in 2001. During First Quarter 2014 Steve Anderson joined FSA Network as COO with a vision to create a world class logistics infrastructure built on the solid foundation of clients in the FSA Network portfolio. The result has been the addition of 6 new market service areas and a 20.3% increase in revenue during the past 14 months. Effective with this most recent asset purchase, Mr. Anderson will assume the new role of President and Chief Operating Officer. 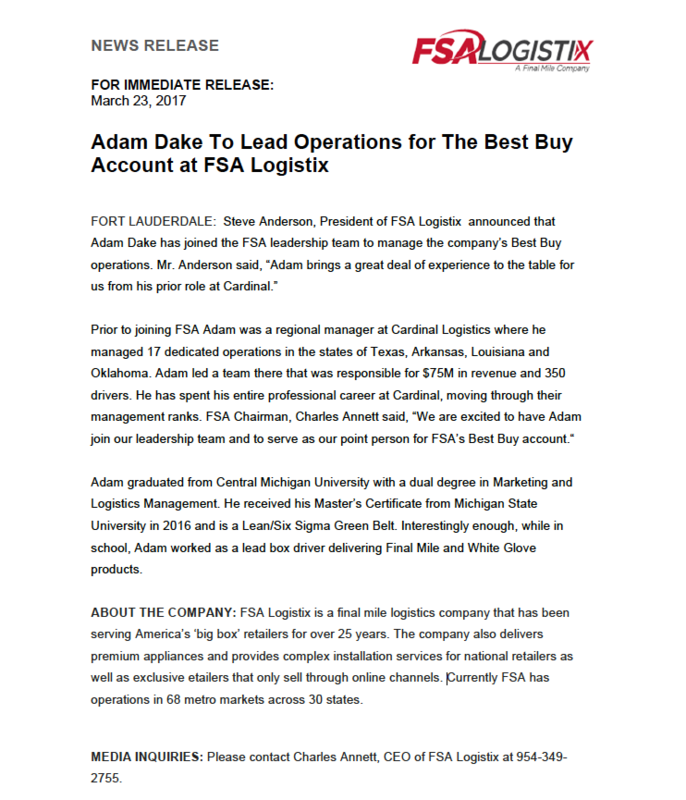 He will be leading the company’s efforts to continue growing the service network and top line revenue for the new FSA Logistix Brand.